As long as there is life, we have a mission and purpose to complete. If God gives a certain amount of work to accomplish in a lifetime, I figure I can retire at 139. In a world where “being busy” is an essential status symbol, this might seem humorous. I took that comic strip down when I realized something important about my two greatest heroes, Jesus and the apostle Paul: they both finished the work God gave them to do! When he had received the drink, Jesus said, “It is finished.” With that, he bowed his head and gave up his spirit (John 19:30). [In his last days, Paul wrote to Timothy:] For I am already being poured out like a drink offering, and the time for my departure is near. I have fought the good fight, I have finished the race, I have kept the faith. Now there is in store for me the crown of righteousness, which the Lord, the righteous Judge, will award to me on that day — and not only to me but also to all who have longed for his appearing (2 Timothy 4:6-8). God’s expectations for me are fulfilled! Wow, that sure sounds refreshing. But will we — you and I — be able to say that when our lives run out of days? I believe we can. I believe we should. But, there are two commitments we must make for this sense of completion, of being finished, to be true for our lives. “My food,” said Jesus, “is to do the will of him who sent me and to finish his work” (John 4:34). 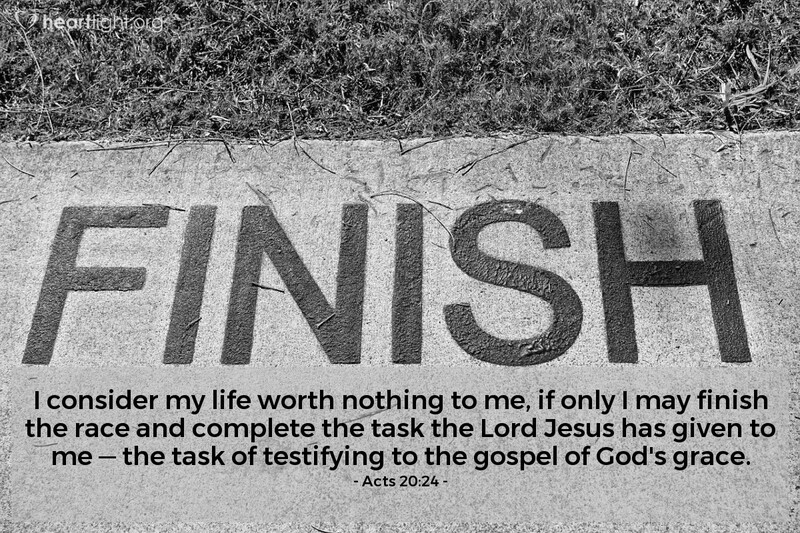 I consider my life worth nothing to me; my only aim is to finish the race and complete the task the Lord Jesus has given me — the task of testifying to the good news of God’s grace (Acts 20:24). God created each of us in our mother’s womb for something only we can do (Psalm 139:13-16). Unfortunately, however, most of us begin to believe the lies of the evil one. He tries to tell us that we are not special, that we have little or nothing to offer, and that the damage done to us in the past disqualifies us from doing anything special for God. Those are lies. 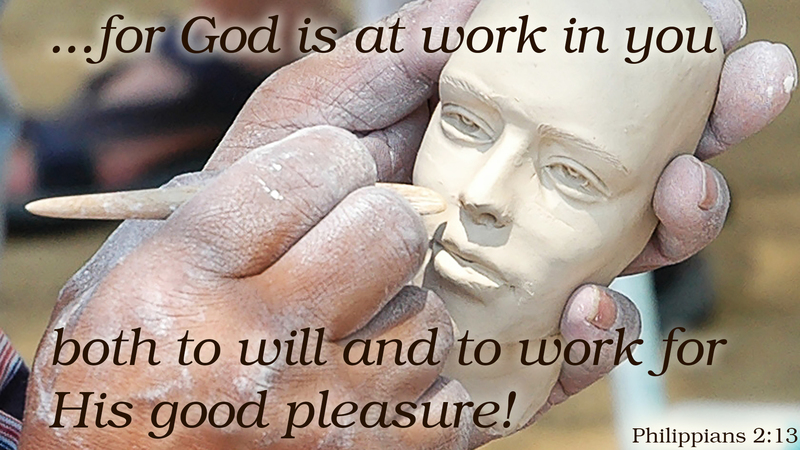 God is still at work in each of us (Philippians 2:13). In fact, he is working to redeem our messes and bring something good out of the mess of our own mistakes, Satan’s vile intentions, and evil people’s acts against us (Romans 8:28). Jesus means that each of us can have new beginnings because of grace (2 Corinthians 5:16-21). We must resist the lies of the devil and believe the promise of God to do something significant through us. 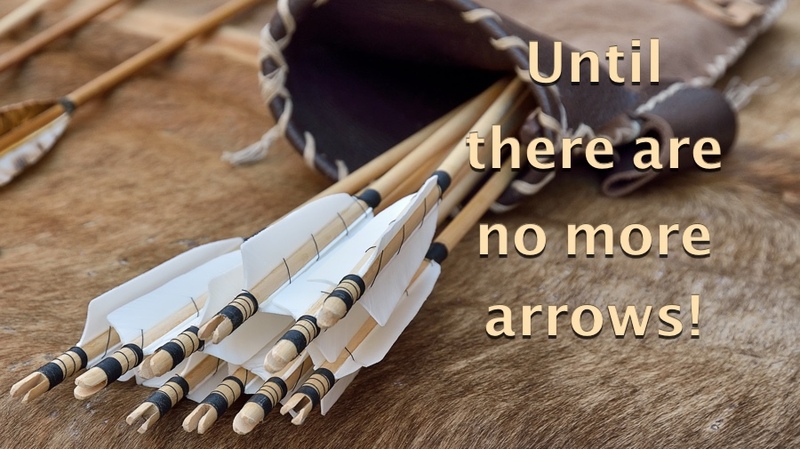 We must not discount what God has positioned us to do! Therefore we do not lose heart. Though outwardly we are wasting away, yet inwardly we are being renewed day by day. For our light and momentary troubles are achieving for us an eternal glory that far outweighs them all. So we fix our eyes not on what is seen, but on what is unseen since what is seen is temporary, but what is unseen is eternal (2 Corinthians 4:16-18). [BOOK] This image comes from Erwin McManus’ recent book, “The Last Arrow.” I highly recommended it to you. 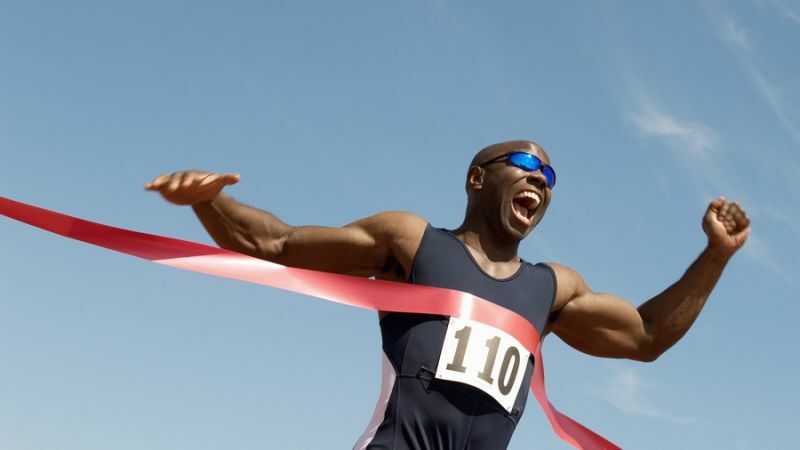 Don’t let your days run out of life, but make sure that when your life runs out of days on earth, you can say the quiver is empty, and I’ve finished my race! "Finish!" by Phil Ware is licensed under a Creative Commons License. Heartlight encourages you to share this material with others in church bulletins, personal emails, and other non-commercial uses. Please see our Usage Guidelines for more information.